Edith Chavez, center front, Alan Altamarino, at back & KU students at Taller Chicharra. While ice storms hit the U.S. a group of Kutztown students spent 17 days of winter break in sunny Oaxaca, Mexico. We worked with a group of talented young printmakers in Taller La Chicharra (translates as the Cicada Studio). Alan Altamarino on press pulling a large scale print with Kevin McCloskey. Alan Altamarino, who also goes by MK Kabrito, runs the studio. He is a recent graduate of the School of Fine Arts at UABJO, Oaxaca. He specializes in large format relief prints. In the image above he carved MDF, multi-density fiberboard, to print a mega-print for his upcoming exhibition in Guadalajara. 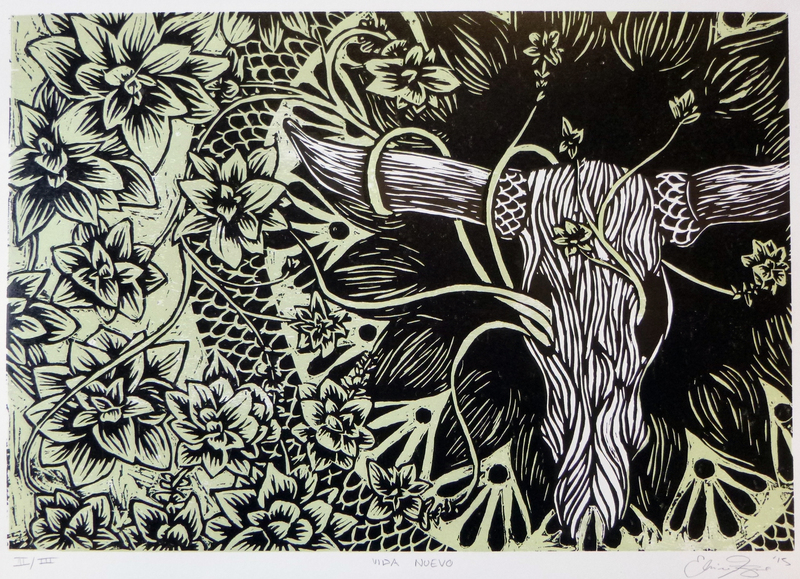 Nueva Vida, 2-color woodblock print by KU student Elaine Knox. Printmaking studio classes were scheduled from 11-4, but at times the KU crew was still working happily as late as 10pm. Of course, they took a long dinner break around 3pm. Some brave souls sampled fried grasshoppers, a typical Oaxacan snack. Each student created an edition of 15 black and white prints for a portfolio to exchange with their classmates. They also created a limited edition with a second color printed from a block of carved plywood. Figura Prehispanica, detail, by Ashley Ridgway. We came as a group with a reservation, but Taller La Chicharra offers short classes for visitors throughout the year. Besides woodblock, they offer classes in serigraphy and engraving metal via electrolysis. Typically, courses are for half-days and last a week. The cost ranges from 500-1000 Mexican pesos, $40 to $80 U.S.
KU student Blake Myers sketching in the mountains of Mexico. “Impressions From Oaxaca” prints from the KU workshop will be on exhibit at the Student Gallery, Sharadin Building, Feb 10-15. We had time for trips to the Prehispanic ruins at Monte Alban and Mitla. A highlight was a journey to the petrified waterfall known as Heirve el Aqua. Muchas Gracias to Alan Altamarino, Edith Chavez, Marcus Lucero, Mariana Rivera, and all the wonderful Oaxacan artists who made our time in Mexico so memorable! Nos Vemos! See you again! Pingback: Impressions of Mexico | "Human Stories in an Inhuman War"
After reading this blog, I contacted the Taller and arranged a woodcut workshop with them! Thanks for the inspiration! Wonderful to hear. Great when an individual artists takes the sort initiative you did, bien hecho!